Never Feed Your Pets Cold Food Again! It's an Animal's Instinct to eat warm food, so why feed them food that's the wrong temperature? The Animal’s Instinct Pet Food Warmer eliminates the problem of too cold or overheated food for your pet. The Animal’s Instinct Pet Food Warmer can store up to four one-pound cans or twelve 5.5 oz cans of unopened food and is even safe for pouches and plastic mini containers! 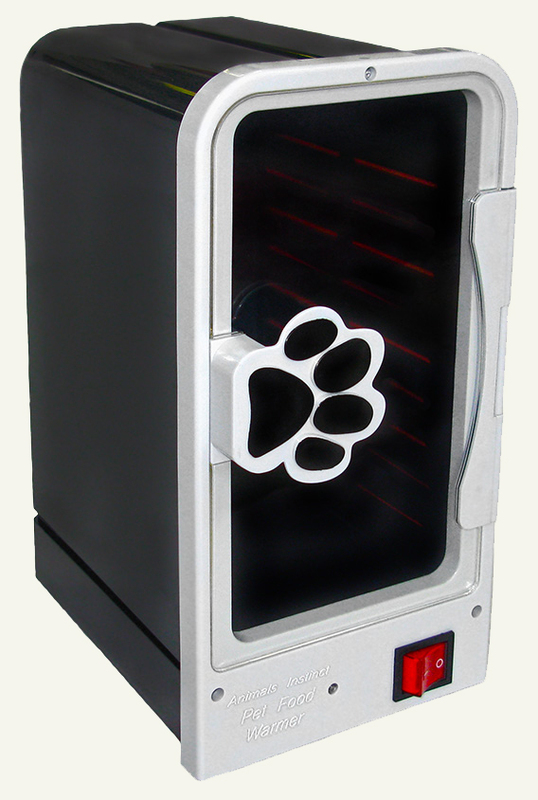 Our pet food warmer has undergone more than nine years of strict testing and research to ensure top quality for your pet. The research proves that dogs and cats prefer to eat food that has been warmed to the natural temperature. The warmer also doubles as a convenient location to store your pet’s unopened food so it’s always ready to serve. Enhance the flavor of your pet’s food by keeping it warmed in the Animal’s Instinct Pet Food Warmer. Your pets will love you for it!